Juan Guaido is the product of a decade-long project overseen by Washington's elite regime change trainers. While posing as a champion of democracy, he has spent years at the forefront of a violent campaign of destabilization. Before the fateful date of Jan. 22, fewer than 1-in-5 Venezuelans had heard of Juan Guaido. Only a few months ago, the 35-year-old was an obscure character in a politically marginal far-right group closely associated with gruesome acts of street violence. Even in his own party, Guaido had been a mid-level figure in the opposition-dominated National Assembly, which is now held under contempt according to Venezuela's constitution. But after a single phone call from from U.S. Vice President Mike Pence, Guaido proclaimed himself as president of Venezuela. Anointed as the leader of his country by Washington, a previously unknown political bottom dweller was vaulted onto the international stage as the U.S.-selected leader of the nation with the world's largest oil reserves. Echoing the Washington consensus, The New York Times editorial board hailed Guaido as a "credible rival" to President Nicolas Maduro with a "refreshing style and vision of taking the country forward." The Bloomberg News editorial board applauded him for seeking "restoration of democracy" and The Wall Street Journal declared him "a new democratic leader." 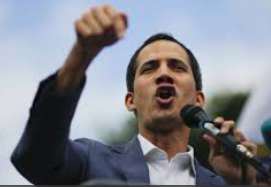 Meanwhile, Canada, numerous European nations, Israel, and the bloc of right-wing Latin American governments known as the Lima Group recognized Guaido as the legitimate leader of Venezuela. . . .